The dinners I grew up with at home were more like option #2 above. 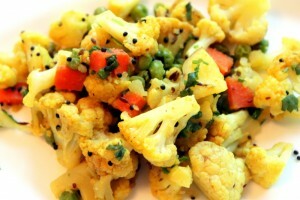 My dad can make a “sabji” or “bhaji” (vegetable Indian dish) out of pretty much any veggie. It’s awesome. We have “Butternut Squash” sabji, “Collard Greens” sabji, “Beets and Beet Greens” sabji – the list goes on and on. It’s a great way to add a twist on a regular vegetable dish, and it’s not something you’d traditionally get in Indian Cooking. Steph 1: Cut the cauliflower and potato into bite-sized pieces and set aside. I like to cut them into a similar size so they cook at the same pace. Step 2: Heat the oil on medium high heat in a large skillet; add the mustard seeds and cumin seeds until they pop. Then add the hing, turmeric, green chile and potatoes. Stir for 15-30 seconds to combine. Then add the cauliflower, carrots and peas and stir again. Step 3: Add the salt and cumin powder, cover and let cook on medium-low heat for 10-20 minutes (depending on how cooked through you like your veggies). Meanwhile, chop your cilantro. Step 4: Right before you’re ready to serve the sabji, add the cilantro. Anjali Shah is a food writer, board certified health coach, and owner of The Picky Eater, a healthy food and lifestyle blog. Anjali grew up a “whole wheat” girl, but married a “white bread” kind of guy. Hoping to prove that nutritious food could in fact be delicious and desirable, she taught herself how to cook and successfully transformed her husband’s eating habits from a diet of frozen pizzas and Taco Bell to her healthy, yet flavorful recipes made with simple, wholesome ingredients. Through her blog, The Picky Eater, Anjali shares her passion for tasty, healthy cooking. Subscribe to Anjali's Monthly Newsletter!